Gaikindo Indonesia International Auto Show (GIIAS) 2015 to showcase the entire national automotive company to bring new cars and concept cars and even cars of the future. No exception PT Nissan Motor Indonesia (NMI) who participated presenting with aura future car racing and environmentally friendly, Nissan Esflow. According to Steve Ardianto, President Director of NMI, Nissan has a high reputation in creating a legendary sports car. In addition, Nissan has created a practical electric family vehicle, the number one in the world, the Nissan Leaf. "Now, Nissan combine two great reputation is to create a vehicle sport high-performance, environmentally friendly and 100 percent of its power comes from electricity, which Nissan Esflow," said Steve currently on show GIIAS 2015, ICE, BSD City, Tangerang, on Saturday August 22, 2015. Steve also stated, this concept car can accelerate from 0-100 km / h in less than 5 seconds. Meanwhile, for the battery capacity, the car is able to cover the distance of 240 km in all content. 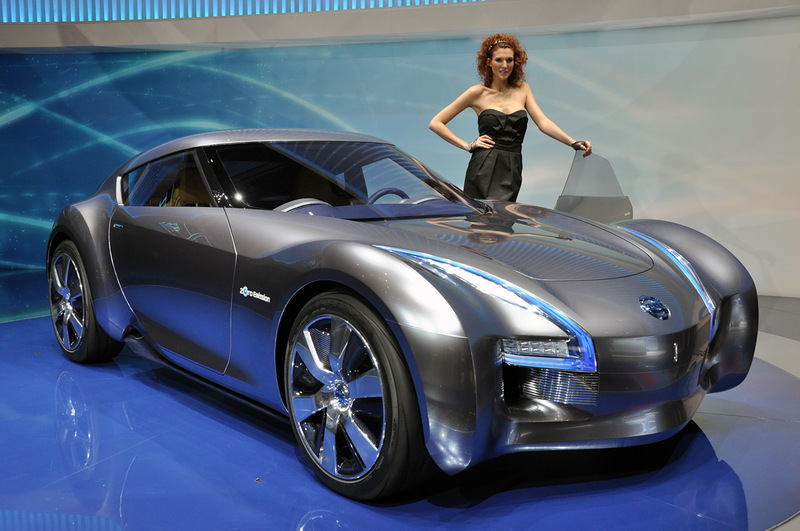 Nissan Esflow is currently still a prototype that was first shown at the Geneva Motor Show February 2, 2015. The two-door sports car with dramatic design became a concept car that can be enjoyed by visitors at the Nissan booth at GIIAS 2015, held 20 to 30 August 2015.